In last month’s column, we discussed steps to take following a fall-down accident. Among other things, we suggested taking photographs of the scene in order to preserve the area as it was at the time of the accident. This month we continue along the same lines, and focus on steps to take following a motor vehicle accident. 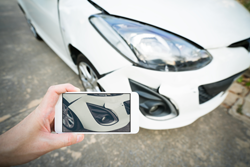 The same way that it is important to photograph the location of your fall in order to understand what caused you to fall, it is crucial that you photograph the accident scene in a motor vehicle accident. The appearance of the location is not likely to change the way that it will with a fall down accident – the configuration of the roadway, for instance, will be the same whether you take photographs on that day or weeks later – but the location of the vehicles involved can be a crucial fact in determining liability. Try to document where each of the vehicles involved was at the time of impact, and where they came to rest. If at an intersection, were there traffic lights, or perhaps a Stop sign? How many travel lanes are there on the respective roadways, and was parking permitted? Was there ongoing construction in the immediate area? Take a photograph of the impact point of the vehicles. Sometimes the vehicles involved stop at the precise point of impact, but other times the vehicles will come to rest a distance away. The resting location of the vehicles can shed evidence on a vehicle’s speed at the time of impact, and therefore can help resolve the issue of fault. If you are able to do so, determine whether a nearby building maintains video surveillance of the area – if we can acquire that video, we’ll be able to see the accident as it actually occurred. Being involved in a motor vehicle accident is always upsetting; you probably won’t be at your best in the immediate aftermath. Still, try to control your anxiety. Don’t blurt out a statement that makes you appear to have been at fault, because those types of statements are admissible in later legal proceedings. Our clients have told us of occasions where an at-fault driver will offer to pay damages out of their own pocket, without reporting the accident to the police, or involving their insurance company. Don’t let that happen – call 911, and report the accident. When the police respond, ask them to prepare an accident report, and tell the officer exactly what happened. If you can’t obtain insurance information at the scene, then try and write down the license plate number of the other vehicle(s) involved, because we can determine a vehicle’s insurance carrier based upon its registration. Be aware that no one can prevent you from reporting the accident to their insurance company, even if they don’t want you to do so. You should also immediately report the accident to your own insurance company, because your own insurance company will pay your medical bills, and certain other expenses too, under No Fault insurance (if you were a pedestrian or bicyclist, the insurance company for the vehicle that hit you will pay). As its name suggests, No Fault pays your medical bills irrespective of fault, so even if the other driver was 100% at fault, your own insurance company will cover your medical bills. The law requires that you report a motor vehicle accident to a No Fault carrier within thirty days of the date of accident, so it’s important that you take care of this immediately, or at least soon after the accident occurs. Obviously, sometimes there will be no question as to whether an injury that you sustained requires immediate medical treatment. In other cases, though, if you have any doubt as to whether you were injured, obtain medical treatment immediately. If you don’t want to go to a hospital Emergency Room, there are Urgent Care Centers that can treat emergent but non-life threatening medical situations. Make sure you inform the admitting clerks that you were involved in a motor vehicle accident, because your own medical insurance will not pay these bills. The White Plains injury attorneys at Worby Vecchio Edelman have nearly 150 years of combined experience representing victims of motor vehicle accidents, and all types of accidents. Call Worby Vecchio Edelman if you or a loved one have been injured. We offer a free, no obligation consultation, at which time we can answer your questions, and explain your rights. We can come to your home, or to a hospital if your injuries prevent you from coming to see us. We’ll let you know if we think you have a valid case, or if you don’t have a valid case. We work completely on contingency, so there’s never a legal fee unless we recover money on your case.